It was so gorgeous returning home this afternoon. The growth in the garden almost took my breath away! Some things, like the potatoes, were almost double the size we left them at, only a week ago. Beans were flowering happily, zucchinis were fruiting, and Genevieve and I ate our first home-grown tomato of the season. What a moment! I love that our years will become increasingly measured, not so much by the arbitrary delineations marked by our calendars, or by birthdays and anniversaries (though these are, of course, delicious in their own way) but by events such as this: The first tomato, and end of season bottling. The first plum on 'our' tree, and opening our first jar of plum jam as the weather cools. The first baby broad beans picked and eaten in the pods, and end of season broad bean, pea and mint pesto. But for tonight, we were happy to sit in the fading light, eating a salad of just-picked herbs, mixed greens, new baby potatoes and fried zucchini, with a bottle of Rocky Hall Rose on the side. Here's to the seasons, and the foods they bring us. Kids, the time has come. The skirt sale has been successful, in that we've raised enough money to get ourselves a whiz-bang pump to move some water around this hill of ours. Yee Har!!! Thank you THANK YOU to those of you who have supported this somewhat unusually-themed sale. It has been SO FUN, trust me. And the good thing is, I still have a few more items to sew, so if you're still waiting, PLEASE DON'T FRET. Your P&E is coming. Soon. 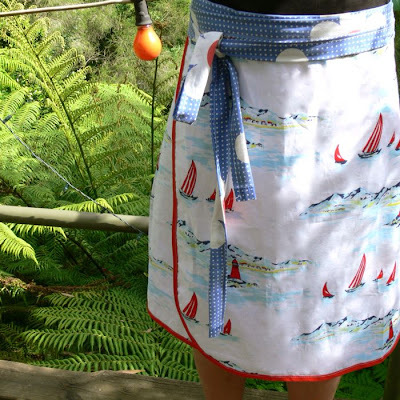 AND if you missed out on getting a dam-pumping custom P&E skirt, you can still find custom P&E skirts at the lovely Georgie Love site here. Geogie Love's flagship custom wrap skirt. No longer available (if you own this skirt, send me a photo!!!) but there are others just as nice. Promise. There are even a few older P&Es that have been marked down on account of them hanging around so long. They need to be out in the world people!! Some of those marked-down ones are even cheaper than the dam-pump-sale skirts. Wooooooo. And here's a photo of Alexis, who was so happy when she got her P&E package 4 that she did a little leaping from foot to foot dance in her office. I love it when people send me photos of themselves in my skirts. That's what I like to see. We're going to be off visiting family for a week, but when we get back there'll be sewing and building and pump-installing galore. Can't wait. "Born at sea in the teeth of a gale, the sailor was a dog. Scuppers was his name"
So begins The Sailor Dog, an absolutely insane Golden Book from 1953. Have you read it? The reason I say it's insane is that it reads like it was written by a very drunk person, and then never edited at all. It's hilarious. Especially if you read it out loud, which I frequently do, because our kids quite like it, though I suspect they're also kind of freaked out by the bizarre (non-) narrative. The reviewer in the link above suggests that it's written like that to be like a kids' train of thought. Olive, Oscar and I are unconvinced. One of my favourite pages in the book - full of really random, rambly sentences... and a bushel of oranges! But we do so love Scuppers, the protagonist in the story. He has an extra-special place in our hearts. You see, Gen's dad, our beloved Peps, had (and loved) the book as a child, so we sometimes refer to him as Scuppers, Scup, or, on very special occasions, Pepe Dawg. The first time Peps-Scuppers-Scup-Pepe Dawg saw the cubby I built for the kids, he said "Looks like something Scuppers the Sailor Dog would build! For a hobbit!" And I think that's kind of an apt description. Like Scuppers' house, the cubby is a little wonky. It uses felled tree limbs ('driftwood') and bits and pieces found lying around. It's little, and it's cozy, and it was made with love and ingenuity. The only thing missing from mine is a dodgy salvaged-brick chimney. But it's gotten the thumbs up from the kids, and many of their friends. My kids like it because they helped along the way - painting and passing tools and screws and nails and helping with the sawing of timbers. Their friends love it because I guess it look like something they could have built themselves. It's approachable, because it's not perfect, and it looks like something out of a kids' book! Amongst the flotsam and jetsam I used to construct the cubby are: 2 telegraph pole stubs, a branch that had fallen out of one of our lovely old trees, an old pallet (for the floor), a window from the tip (of course! ), hardwood fence palings ( I know - they're AMAZING), some corrugated iron that came off the old Candelo Post Office (from my lovely and generous friend David, who also donated some alsynite offcuts) and some corflute weather boards. Yes folks. That weird plastic stuff that real estate signs are made from is an awesome building material. Firstly, it's free. Secondly, it would otherwise go into landfill. Thirdly, it's strong and lightweight and easy to cut. Yes, yes and yes. For the cubby, I always planned on using a bit of corflute, inspired as I was by some corflute re-use in the awesomely inspiring book Turning Trash into Treasure for Young Children. Sometimes I thought I could use it as shingles for the roof (too hard), then I thought I'd just use it whole for the roof (too many joins and therefore possibilities of leaks) and then I thought I could use it for the walls, layered like weatherboards to make it pretty water-tight. I'm a fan. Painted with a bit of gorgeous blue paint (also from the tip) you'd never know it was corflute. Looks like weatherboards, right?? 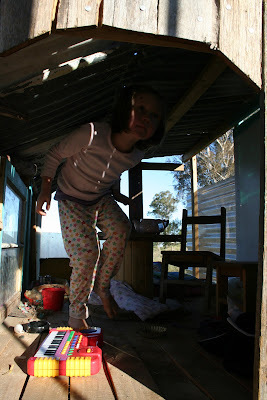 Moving into our tiny strawbale has been pretty easy in many ways. Easier than I thought. Annie, being a consummate optimist and pretty intrepid in the adventuring stakes probably always thought it would be fine. But me, I was a little nervous deep down. Thankfully my nerves were unfounded and it has been really quite wonderful. There's only one thing that has really been niggling at me and this is our total absence of an oven. For I love to bake! I love getting all domestic goddess-y and ensuring there are baked treats aplenty for our family and for whoever happens to be around at any given time. For now, this is not possible as our cooking is done entirely on a BBQ and a portable gas ring. Recently we've added a fire to our cooking but this still doesn't really allow for the possibility of cakes, biscuits, pies etc etc... As result we are eating a lot of pikelets and a lot of fruit... it's probably all for the best really. However the lack of baking possibility has gotten me down on a few occasions. In time we will build an outdoor wood fired oven and in time we will build another strawbale dwelling which will contain no less than a commercial kitchen and a cold store for all our pasture raised smallgoods creations mmmm.. but that is a story for another time. In the meantime I have Moro! Some beauteous friends, perhaps knowing I'd be feeling the lack of an oven, bought me Moro East for my birthday, and it is so suited to where we are now, in our eating and our living. Really, it was a revelation and gone was the lack. So perfectly timed was it with our increased zeal for foraging, helped in no small part by our reading of The Forager's Year, Whole Larder Love and the fact we live in a place where foraging is really pretty easy. Annie had noticed a large swathe of stinging nettles in the paddock across the road from our place. She'd read about them a few times in various permie and foraging-related texts and blogs, and was enticed by their outrageous health benefits (the highest protein levels of any plant food, including soy beans!) and promises of an 'earthy spinach' flavour (as opposed to the almost ubiquitous 'bitter' of every other foraged greenery you seem to come upon). In light of all this, we thought we'd help the farmer out by helping ourselves to their nettles. 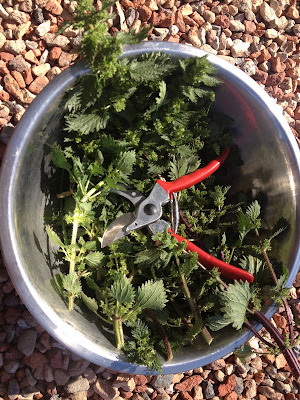 The nettle urge combined with the over-abundant greens in our garden and a desire for a fireside dinner made gozleme the perfect choice for our dinner this Sunday night past. Thank you Moro East. The delicious simplicity reminded me of my time in Oaxaca Mexico many moons ago where my favourite lunch was from a particular stall in the markets. It was a quesadilla comprised entirely of shredded zucchini flower and Quesilla (a Oaxacan stringy cheese) eaten with pico de gallo it was utterly delicious and an important reminder of just how good simple, fresh food of a particular place can be. I was reminded of this once again this Sunday night when we feasted so happily around our fire. The dough was made earlier in the day then left in a covered bowl on our tyre retaining wall. It may not be pretty but those tyres sure capture the warmth of the sun, working a treat for dough that needs to "double in size". Then when we returned from an uber-delightful birthday party at Mumbulla Creek Falls we were ready to start making. Oscy, forever the helper, cooking up the pre-dinner lemony cumin-y cauliflower - "I being like Per!" It was a good reminder of how well we can eat with so little. In the past I've gotten caught up in seeking out particular ingredients to create particular meals. This approach is all starting to feel a little wrong. This meal was dictated by what we had grown or found + a little flour, olive oil + a little South Coast fetta. This feels so very right and definitely points to our way of eating for the future. And the result? Now I don't want to diss the very talented and hardworking Turkish ladies at all the markets everywhere but these gozleme were pretty much the best ever. We could taste the myriad different fresh and zesty greens contained within the crispy, warm, olive oil bread. The kids were happy, we were happy. It was total sensory overload, total joy, just so very good. We've been lucky the last couple of weeks: we've had a reasonable amount of rain. Not the massive dump kind that fills your water tank, but the slow and steady kind that doesn't run off, but sinks right in. The kind that, when you're not looking, makes your veggie plants double in size seemingly overnight. 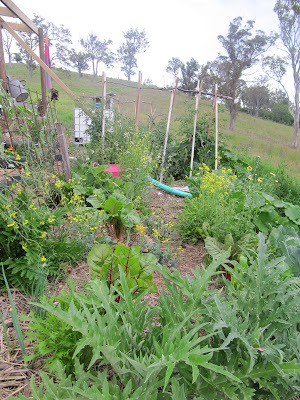 The days are warming up, too so everything's absolutely alive, and doing what we planted it to do - grow us some food. Every day we stroll around our little kitchen garden, taking in the sights and sounds and smells. 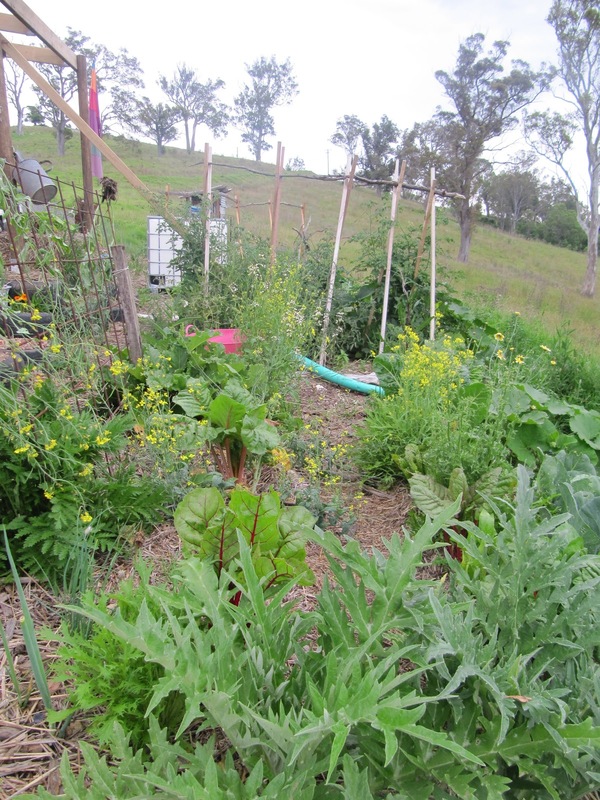 Well, actually we kind of have to since our house is at one end of it and our dunny is at the other, so we have several enforced garden strolls per day, which means we can weed, pick off snails and slugs and caterpillars, monitor growth and check for baby tomatoes/zucchinis etc. It is such a joy to have the garden so close by. Those permaculturists are really onto something right? Zone 1 (having all the things you need to see and interact with every day) definitely makes sense when you read about it in books, but it really really definitely makes sense when you're living it. We basically eat dinner in our veggie patch, which means that we can see it and watch it and truly observe and interact with it, in the way we rightfully should. We're loving it. We're also pretty much in love with our zone 2, as well - the things you need to see kind of regularly but not necessarily every day. That, for us, is our bee/duck/orchard area, which is between our house and the road. It's reached by the ever-impressive and gorgeous sleeper-stairs built for us by beloveds peps, Genn and Jeff, and while we do go up there very day to hang out with the ducks, let them out in the morning and put them to bed at night, and generally monitor the state of things and watch out for nasties like peach leaf curl, we don't have to walk through it every time we need to wee. The ducks free-range in the day, coming to visit us and patrol the veggies for snails and clean up after the kids, but mostly stay close to the dam. Egg-laying location has become a mystery, however. The down-side to the roaming duck. Apparently you're supposed to keep them in their house until they lay for the day, then let them out to range, but sometimes we just can't wait. And it's oh so cute to see them all waddling out together all in a line! Like I said - we'd read about the zone bizzo in about a million permaculture books, and had always been a bit "yeah yeah" about it, never having really had the opportunity to put it into place. 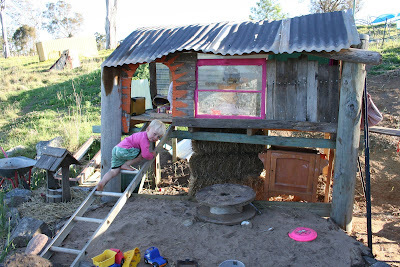 Our last house, for example, only had 1 (kind of) sunny spot, so we were forced to have our veggie patch on the street verge and 'car port' area, which was about 60 big sandstone steps away from our house. While we did pass our veggies every day while leaving or coming home, we were inevitably rucking to get a train/carrying groceries or kids/basically focused on something else. Not so now (though we are still frequently carrying our little Oski-boy). Now we have the time to take it all in. To meander the paths. To pick, and weed and mulch and hill up potatoes, just as part of our day to day life. I can do it and still have a conversation with Pearl while she's cooking the dinner, and she can do it while I'm sewing at the table. Last night, I did it while Pearl and the kids were in the fire bath. We chatted and joked and planned and plotted. It was gorgeous. The moral of the story? Put your veggie garden as close as possible to the centre of your life. Our veggie garden, in the middle of our kitchen/bathroom/dining room is giving us more joy than we ever could have imagined. Every day. Thank you all for your patience, and thank you for supporting sun-powered hand-made! And a beautiful pink-and-purple rosey print skirt for Siggy as well. I had fun, and hope you have fun wearing your goodies. It was nice to get reacquainted with my fabric and teatowel collections. It was nice to sit outside in the evening air, chatting with Pearlie and taking in the view as I pottered along. I felt so happy knowing that I could use my own hands to make these goodies to sell to you kind folks, so that we can buy the little pieces of infrastructure we need to make this tiny-farming adventure of ours a little easier. I felt grateful to all of you for taking a moment to think a little about positive ways to spend your money, so that your hard-earned bucks can go towards a little positive change in the world, and not just line the pockets of a greedy chain-store owner who makes clothes that rip off the makers, consumers and our poor old beleaguered planet. Thank you all. I feel humbled and honoured to be able to sew like this, just a little, sometimes, when the need and desire arises. I do hope you enjoy wearing your gear. To those of you still waiting, there is more coming, soon. I promise. We've almost reached our goal, so tell your friends that if they're quick I can still make a couple more packages for this sale of ours. Or, if you're happy with what you get, you can buy one for a friend as a Christmas-time gift. Trust me - it'll be a gift that keeps on giving, and I promise to think of each and every one of you and your lovely skirts every time I don't have to haul water by hand.